Last night’s Seven Minutes In Hell episode was a, sorta, kinda bottle episode. The majority of the action takes place in the labyrinthine KKT house. So what happened? Who died? Who is the Red Devil? I Said Hey, What’s Going On? Chanel & Zayday split the vote for KKT president, now they are co-presidents of our doomed sorority. Chanel tried to throw the election by voting for Zayday in a bid to survive the longest because the Red Devil will obviously want to kill the KKT president most. Chad Radwell receives an intervention from his fellow Dickie Dollar Scholars because he’s been sexing up too many “old women”. In his defense, Dean Munsch is smoking hot and Denise Hemphill is real fun. Chad Radwell broke into the KKT house in an effort to break the KKT ladies out. All you need to break into a house designed to be a safe room is a ladder and a bat. Zayday and Grace know that one (or more) of the KKT sisters know what’s up with the Red Devil. That can only mean one thing: Slumber Party! Slumber parties MUST have four things: LOTS of watermelon wine coolers, spin the bottle, truth or dare, and seven minutes in heaven. Sleeping optional. Dirt naps mandatory. Chanel #3 and Sam spin the bottle and share a sapphic kiss. Chanel #3 realizes she loves love. Esther gets Chad Radwell along and gets his motor revving. Chanel and Chad Radwell spend 7 minutes in heaven. Chanel and Chad Radwell decide to go steady. He gives her his school ring and pledges his undying monogamy. Chanel #5 and Roger spend 7 minutes in heaven only to have it cut short by a devil in a red dress. The Red Devil finished what they started with everyone’s favorite armless Dickie Dollar Scholar. Lizzy Borden style. Sam, everyone’s favorite lesbian sorority sister, hops in the tub and gets her breath taken away. Roger, no one’s favorite twin, goes in for a kiss only to get a face full of nails. 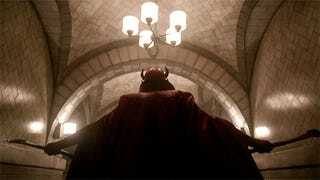 So are we any closer to finding out who is behind the Red Devil mask? No. But Sam’s hunch is validated. But Sam’s dead, so……...you know what show about sororities and frats I really liked? Greek. That was a good show. Sigh……..
No Scream Queens next week. Instead, watch Baseball. Or Agents of SHIELD. Madeleine Muses About How Roger Is A Total Pinhead. Cheryl Knows The True Crime Is Not Knowing Who’s the killer? Ugh. WHO CARES ANYMORE?